Events - If Not Now, When? ​"The Future of the Two-State Solution: Is a Peaceful Resolution of the Israeli-Palestinian Conflict Possible?" With the Oslo peace process moribund, opposition is rising to the concept of a two-state solution. Questions are growing even at the diplomatic level. There is good reason to question. Israel’s expansion of settlements threatens the viability of any future Palestinian state. Both Israelis and Palestinians believe the other side is not interested in an agreement. And leaders of both communities regard steps toward a resolution as far too politically costly. Within this context, Washington, D.C.-based analyst Mitchell Plitnick will discuss reasons for Oslo’s failure, review the current situation and discuss prospects for the future. He will argue that two-state frameworks beyond Oslo remain possible. 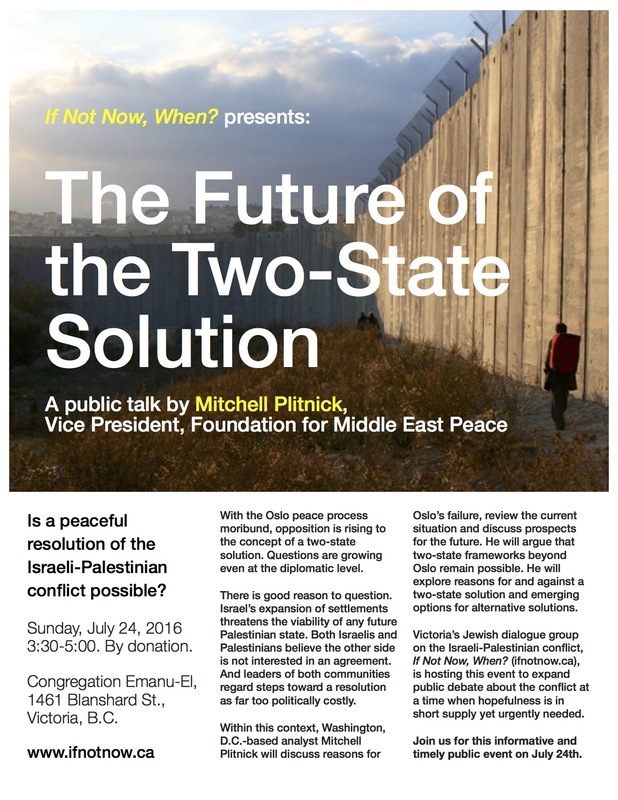 He will explore reasons for and against a two-state solution and emerging options for alternative solutions. Victoria’s Jewish dialogue group on the Israeli-Palestinian conflict, If Not Now, When? (ifnotnow.ca), is organizing this event to expand public debate about the conflict at a time when hopefulness is in short supply yet urgently needed. Join us for this informative and timely public event on July 24th. "Globalizing the Israeli-Palestinian Conflict: New Frameworks for Peace"
​It is virtually a diplomatic axiom that the conflict between Israel and the Palestinians can be resolved only through bilateral talks rather than by a solution imposed from outside. Washington, D.C.-based analyst Mitchell Plitnick proposes that this is not necessarily a binary choice. While an imposed agreement likely would be unsustainably fragile, bilateral talks also have a low chance of success due to the enormous imbalance of power between the two sides. An alternative path therefore must be forged involving considerable international pressure on both Israel and the Palestinians to engage in real negotiations within a framework that reflects the international consensus. Changes in the international arena, however, are threatening to de-prioritize this conflict. Globalizing the conflict is thus part of the problem and the solution. A realistic resolution requires a new global framework for negotiations. This informative and timely public talk is presented by Victoria’s Jewish dialogue group, If Not Now, When? 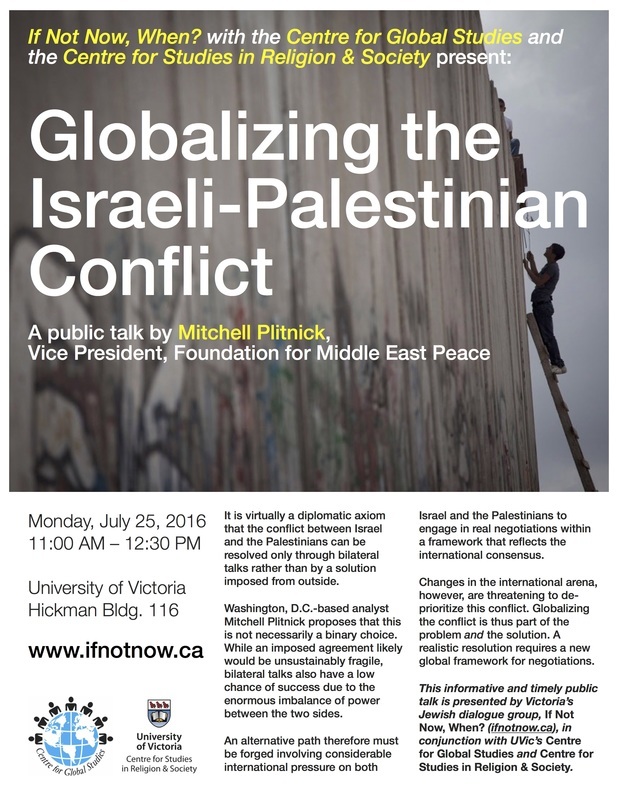 (ifnotnow.ca), in conjunction with UVic’s Centre for Global Studies and Centre for Studies in Religion & Society. All donations to the If Not Now, When? 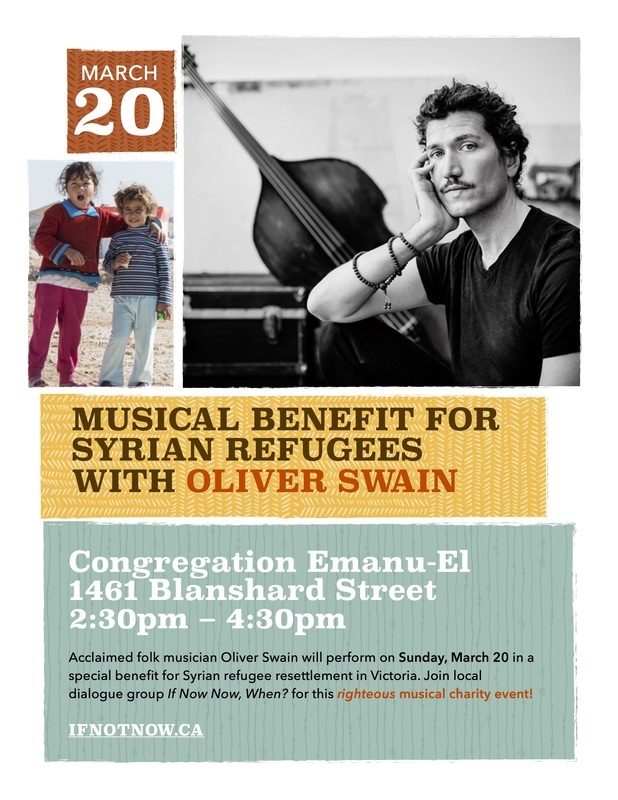 benefit concert with Oliver Swain on March 20 will go toward the resettlement of a young refugee family arriving in Victoria from Syria this year, whom Congregation Emanu-El has chosen to sponsor via the Inter-Cultural Association of Greater Victoria. Donations are tax deductible (receipts will be provided upon request). Suggested donation: $15-35 (children, free). If you cannot attend the event but would like to contribute, we would be grateful. Please fill in the form at the bottom of the home page and we will contact you.